Halifax Harriers’ Max Burgin ran the fastest ever time by a 15-year-old for 800 metres at Stretford on Tuesday evening. The Crossley Heath School pupil became a world record holder with his time of 1:49:42 at the BMC Gold Standard Races in Manchester. 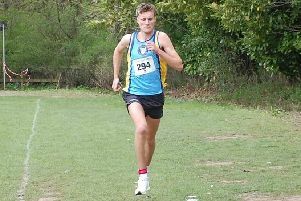 Burgin was competing in an open age race and finished third behind David Palacio of Spain (1:48.36) and Stephen Knuckey (1:49.37) of Australia. Max was stepping up on his effort at the British Milers Club Grand Prix at Sports City, Manchester a month ago. On that occasion he clocked 1:50:04, which was the third fastest time by anyone under 17 in the UK. Having just gone 15, he has a great opportunity to push back the under 17 barriers on his way to possibly a top career. Last year Max won the Yorkshire Championships, Northern Championships and English Schools Championships.